AMD says that both HP and Lenovo have started to ship their first systems built around the 7th Generation AMD A-Series APUs. The OEM PCs featuring these 'Bristol Ridge' processors will benefit from the new AMD AM4 platform supporting DDR4 memory, next-gen I/O, and other qualities. A PC system based upon one of the new APUs is said to "deliver high-speed processing, smooth eSports gaming, and enhanced HD and UHD streaming". 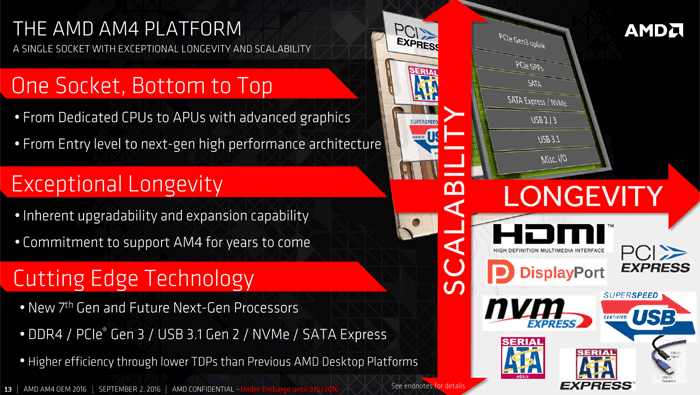 The new range of 7th Gen chips from AMD will include a maximum of four 'Excavator' cores. 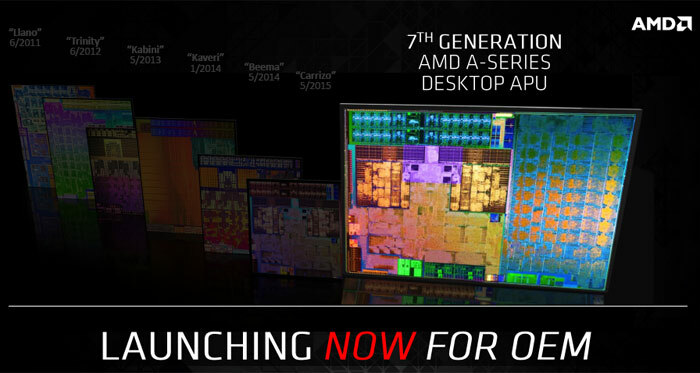 Today AMD has revealed eight new processors; there are five quad-core APUs, two dual-core APUs, and one quad-core Athlon X4. Check out the chart below for individual processor details. AMD highlights that these 7th Gen processors top out at 65W, yet offer performance that could only be realised at 95-watts with the previous generation. 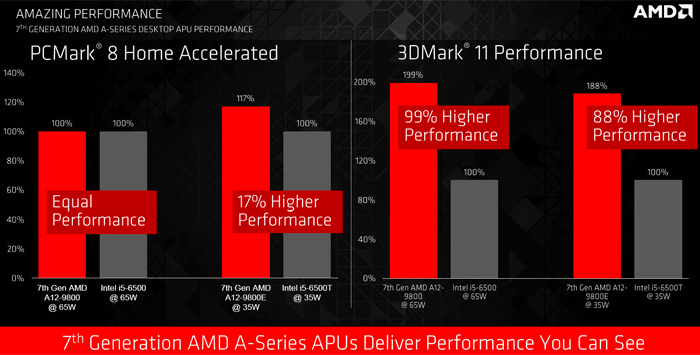 Talking of performance, AMD has provided an interesting comparison of the new A12-9800 APU pitted against the year-old quad-core Intel Core i5 6500 65W processor. AMD says that its A12-9800 can offer "up to equivalent productivity performance and up to 99 per cent higher graphics performance," than the Intel chip. PCMark 8 v2 Home was used to compare productivity (scores: 3483.25 vs 3466.5) and 3DMark 11 Performance was used to compare graphics performance (scores: 3521.25 vs 1765.75). Systems both used 8GB dual-channel DDR4 RAM, 228GB SSD, and Windows 10. The AMD system used DDR4-2400 RAM, while the Intel system used DDR4-2133 RAM. Performance-per-watt scores looked even better for AMD - but you will notice a more diverse range of parts have been 'cherry picked' for these graphs (directly below). 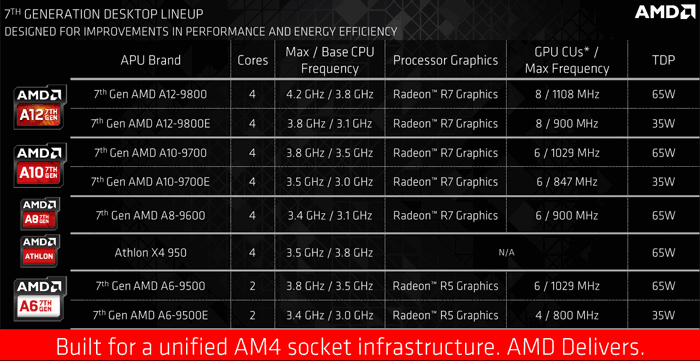 Other important features of the 7th Gen chips from AMD centre on enhanced graphics and video playback features. AMD's new 'Bristol Ridge' parts support up to 4K Ultra HD in both the popular H.264 and new-and-improved H.265 formats, APUs fully support GCN and DirectX 12. The AMD AM4 platform provides next gen I/O and peripheral support including PCIe Gen 3, USB 3.1 Gen 2, NVMe, and SATA Express. It also offers higher power efficiency than previous AMD desktop platforms (up to 70 per cent power used compared to AM3+). AMD says that the new HP and Lenovo designs featuring AM4 show the ecosystem's readiness for the upcoming high performance 'Summit Ridge' processors, based upon 'Zen' cores. AMD has a "commitment to support AM4 for years to come". The above will be joined by an as-yet unnamed 'enthusiast' level chipset. And it confirms that 10nm Ice Lake laptops will be available by the holiday season. The above will be joined by an as-yet unnamed ‘enthusiast’ level chipset. That A12 9800 looks pretty nice - 3.8GHZ to 4.2GHZ clockspeeds for the CPU and around 1.1GHZ for the GPU core!! So when is it being released for DIY PC builders together with socket AM4?? … So when is it being released for DIY PC builders together with socket AM4?? I have a horrid feeling it might not be, although at least with products at OEM it might give mobo manufacturers a bit more confidence that they can deliver a decent desktop experience - I'm actually pretty impressed by what they've acheived in the 65W envelope there. There were HD7750 GDDR3 models IIRC?? I wonder if the IGP uses the colour compression technology seen in AMD GCN1.2 GPUs onwards?? So combine that with GDDR4,it might help a bit. 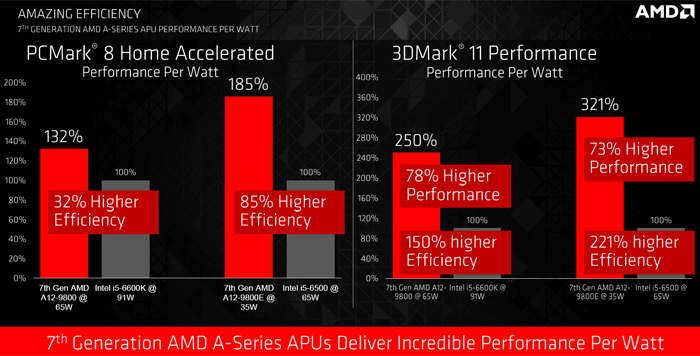 Kaveri lacks it,so it will be interesting to see how the A10 7860K and A10 7890K fare in comparison. Yeah, but they were quite a bit slower iirc. Still, even 2400MHz DDR4 would provide more memory bandwidth than they had…! … I wonder if the IGP uses the colour compression technology seen in AMD GCN1.2 GPUs onwards?? So combine that with GDDR4,it might help a bit.